Fracking is absolutely safe and everyone should be doing it in their own back gardens according to a new report by Lancashire County Council which looks set to be used as a blue print for the country as a whole. The report entitled ‘random drilling and shooting jets of water at great velocity into the earth’s crust is fine’ concludes that the more people who have a go at it, the more likely someone is to find some oil or gas sooner or later. One Preston resident we spoke to told us that the practise of fracking was becoming even more popular than keeping pigeons in his neighbourhood. “I suspect that the green brigade would rather I grew some flowers or potatoes in my back garden rather than the 30 foot drill I keep running 24 hours a day. But I might strike oil or gas and be rich like in the Beverly Hill Billies. And I haven’t had any complaints from the neighbours. Probably because they’re all at it as well. 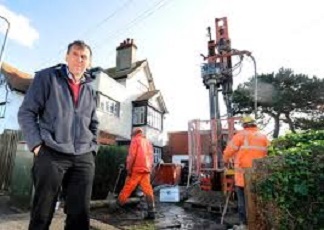 “After all who hasn’t fracked in their back garden? It’s not been something you admit to down the pub but everyone’s been doing it.” He told us. Indeed Secretary of State for Environment, Food and Rural Affairs Elizabeth Truss said she hoped the trend would take on throughout Britain. A spokesman for the Friends of the Earth has applauded small scale micro-fracking as a step in the right direction. “We’ve always said we’re happy with fracking as long as it’s organic” He explained.